Former Vice President Joe Biden has gone viral – one again. Joe Biden has been having one hell of a run on social media since the election. First, there were those Joe Biden memes mocking Trump that took the internet by storm the same week as the presidential election. Then, there was that White House video of VP Biden and Pres. Barack Obama mocking life after the White House. Next, in another slam on Trump, there was a White House video we pulled out of the vault showing what happens when Joe Biden and Julia Louis-Dreyfus decide to skip the White House Correspondents’ Dinner. 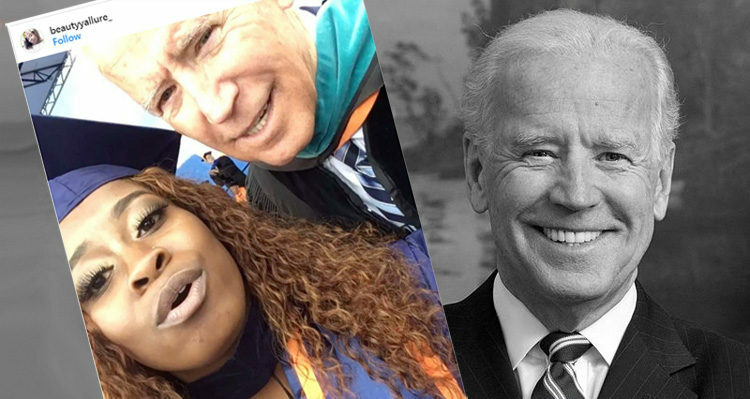 Biden finds himself going viral again this week after Morgan State University graduate Brieana Carter posted a video selfie of herself and the former Vice President on Instagram. Carter told NBC that she initially had trouble getting the video, but was determined to get it right. “The first time, the picture was blurry. The second, Snapchat was glitching. The third time, it was a charm, she said. In the video, Biden can be seen smiling for the camera, and then he turns to give Carter a tender kiss on the cheek. You can then see Carter letting out a scream of joy as Biden walks away. “He kissed me on the cheek because I’m cute, and because my phone wasn’t working,” said Carter, adding that her father told her he was jealous and gave her a kiss of his own on her cheek.